We got tired of not having a good cheat sheet at hand to convert uptime percentages to downtime and vice versa, so we made one. Hopefully you will find it useful (I know we will). 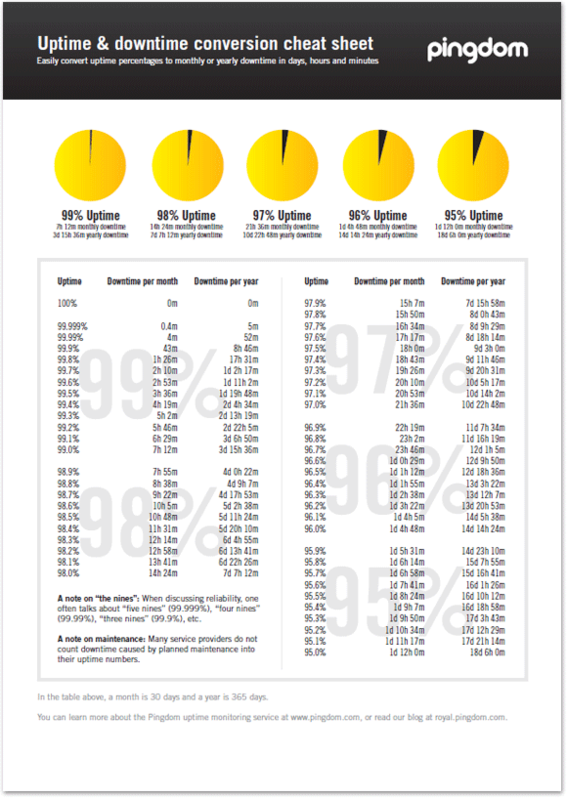 Download the Pingdom uptime cheat sheet. Print it out and use it as a reference when you need to quickly check how much downtime in a month 99.5% uptime actually allows for (just an example). It’s very handy. All information on just one page! Again, download the full version here. Is this white label report where we could replace pingdom logo with our own and provide it to clients in nice .PDF file? @Tom: No, that’s not ok. But you’re free to use it and spread it around. Just don’t modify it. The PDF link is broken. Thank you, we had that fixed now. What’s the uptime on that pdf link?